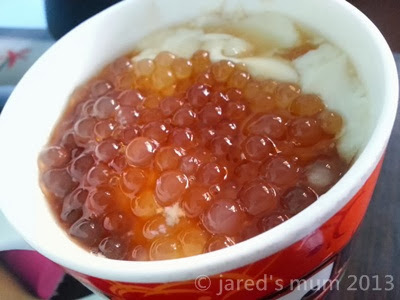 Whenever I hear the street peddler shout “taho” every morning I make a mental note to get up earlier the next day so I can buy me a cup or two. So today I was prepared. I was out the door as soon as I heard manong shout. This old Pinoy food reminds me so much of my childhood as I used to eat these with my siblings when I was a little girl. My perfect part is chewing on the gooey pearls and the silken tofu. I usually do not like much arnibal or sweetener as my tummy has low tolerance for it in the morning. This entry was posted in comfort food and tagged breakfasts, Pinoy Food on 21.February.2014 by admin.